Cook can’t wait for teams to attack Wigan Athletic! 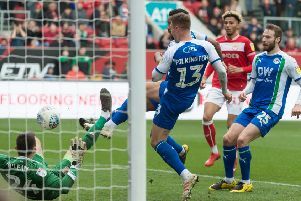 Paul Cook fully expects his Wigan Athletic side to be attacked by the biggest and the best teams the Championship has to offer next term, writes Paul Kendrick. And the Latics boss couldn’t be happier about the prospect, given the success his men enjoyed during their League One title-winning campaign against sides that took the game to them. Wigan’s away record was even better than their home form – 51 points collected on the road compared to 47 at the DW. And Cook says Latics will welcome the opportunity to show what they can do against more positive opponents. “I think the set-up of the opposition helped us in away games this year,” Cook told the Wigan Post. “Look at the games against Oxford – at their place when they try and win the game (Latics won 7-0), and at our place when they didn’t show any intent (Latics won 1-0). “That’s football – it’s the same team, the same lads, but with a different intent. “You’ve always got your part to play in a game. For me and our players, we always try to play our part in the game to try to win it. “Sometimes the opposition don’t do that...but that’s football, and it’s fine by the way. If you have a team that you don’t feel can win a game, you’re going to go down a different avenue to try to win the game. “That’s led to us having maybe a couple more 0-0s at home than we would have liked.